Matt and I have been in Florida for a little over a month now so we figured it was time we started to meet our neighbors. After all, we don’t want to be known as those stuck up yuppies from Chicago. We have quite the Midwestern reputation to live up to. 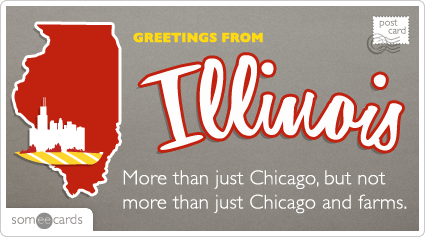 And seeing as how nearly everyone we’ve met is from somewhere besides Florida, it’s been interesting to experience all of the regional idiosyncrasies our neighbors display. Take Arnold for example. He originated in South America but relocated to Florida to start a new career so we have that in common. 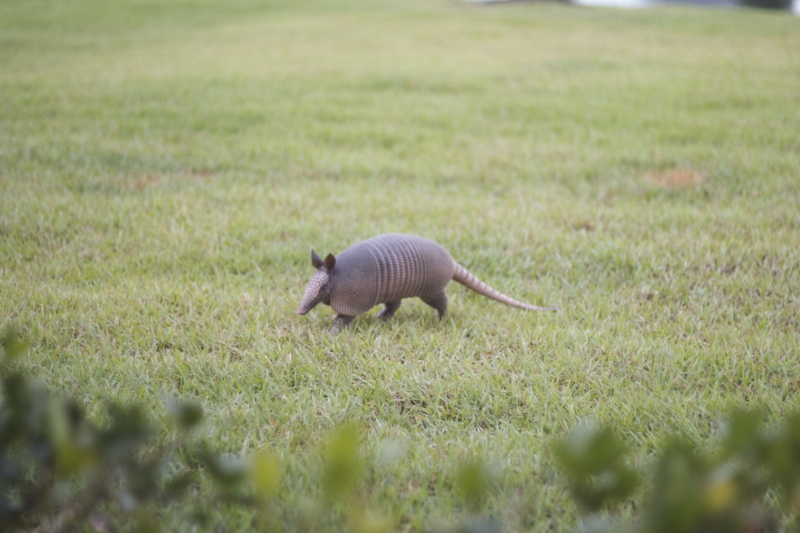 Armadillos are not native to Florida, but are now common over most of the state. 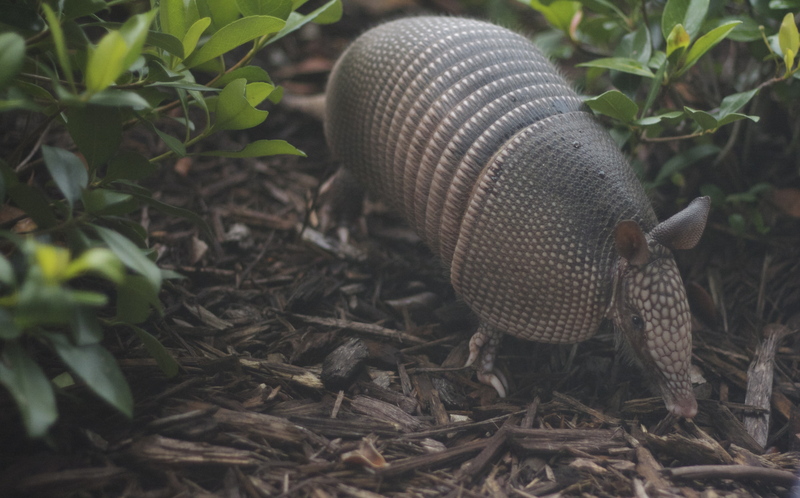 Armadillos like forested or semi-open habitats with loose textured soil that allows them to dig easily. 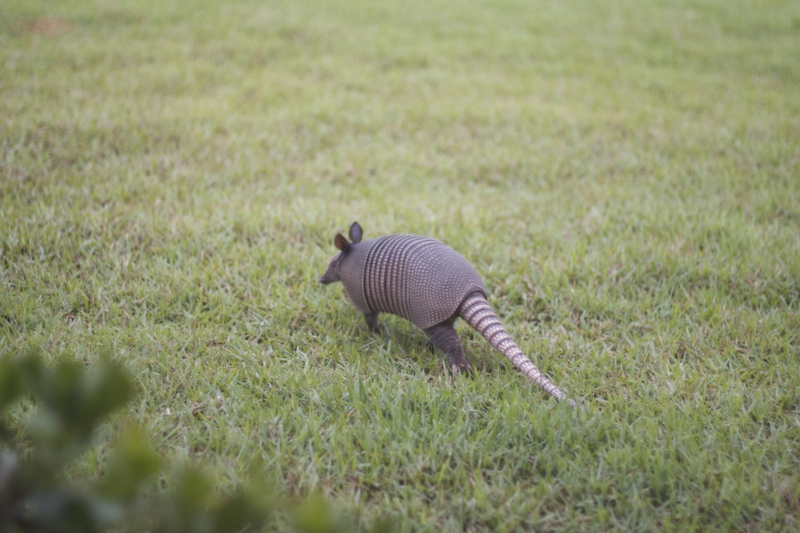 They eat many insects, or other invertebrates, and some plants. They most often feed at night, and have very poor eyesight. 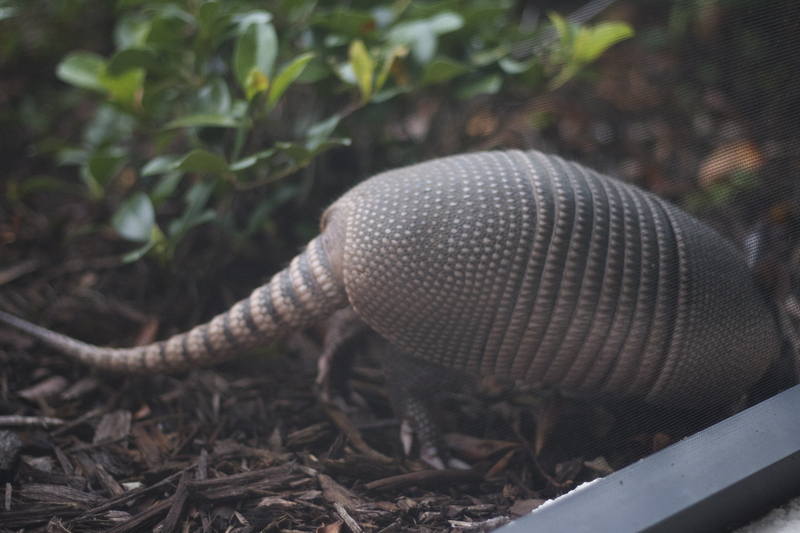 (source) Arnold came over for a visit this morning. 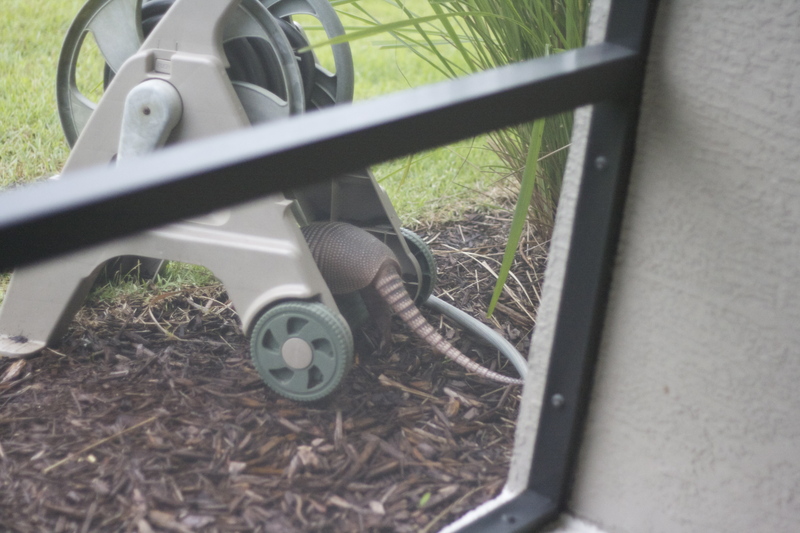 He spent a little time digging around our lanai and then headed East in search of more insects. Later on a walk with Finn, he showcased his poor eyesight by crossing right into our path. 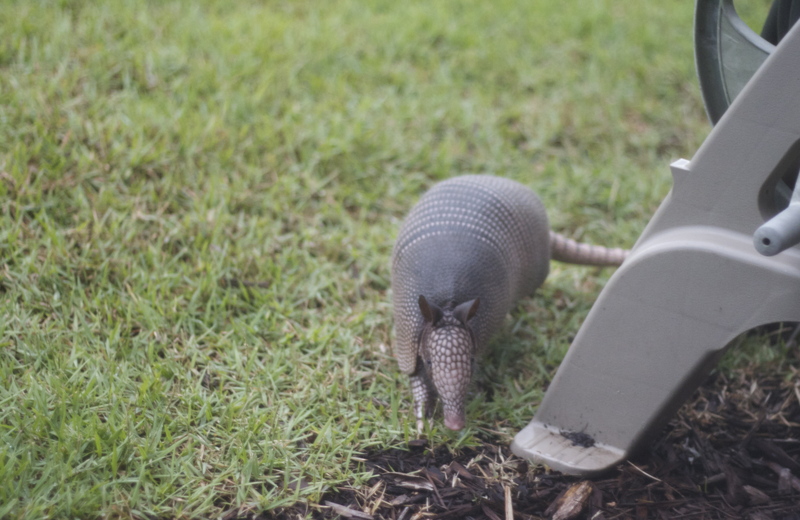 Fortunately for Arnold, Finn destroyed his armadillo chew toy around 7 months of age so he wasn’t interested in much other than sniffing Arnie back towards the bushes. Then there’s Hank and Susie the sand cranes. They are nearly inseparable and very chatty. It’s rare you see one without the other. One day when I spotted Hank wondering along the pond without Suz. I can only assume he made eyes at another lady crane and she gave him the cold shoulder feather, but I’m not one to judge. They seem nice enough but are quick to take off if we get too close to them. Guess they’ll take a little warming up to. 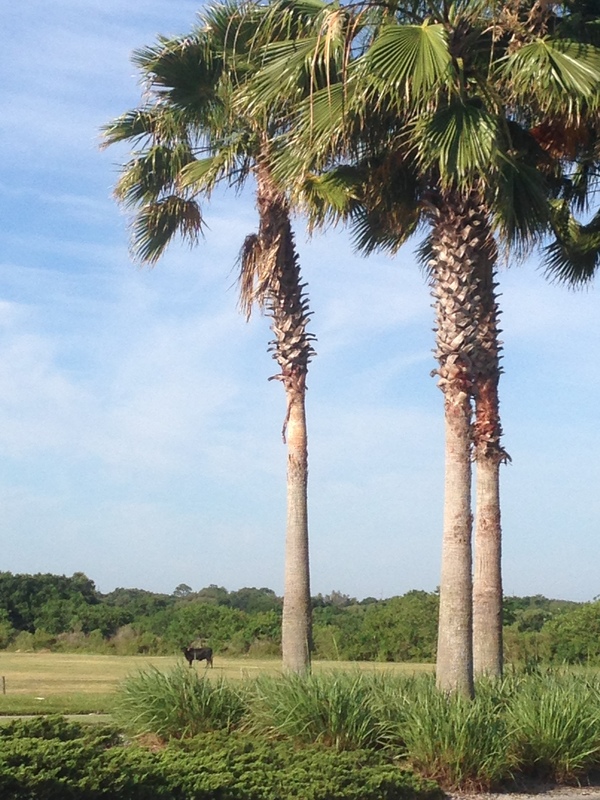 Benny the bull is pretty shy. He just stares whenever I run by him. Unfortunately were too late to meet Carl the corn snake. He passed away before we could be properly introduced. I have a photo of him but I don’t feel comfortable sharing it without his permission. I hear he was pretty slimy so it’s probably for the best. So for those of you concerned about us making new friends down in Florida, fear not. We are doing just fine. I have decided to stop following your blog after these horrific pictures of Arnie..he is so gross. Arnold will be sorry to hear that. He look tough but he’s soft on the inside. Arnold looks to be in much better shape than his cousin that you photographed as we were leaving the Ozarks a few years ago!! I know! Although he was headed towards the road last time I saw him. No red solo cup for this guy.